Thanks so much for this post! I had been feeling fairly lost while slogging through the numerous api options out there. I now have a somewhat better idea of the current state of things. (1) use google spreadsheets to store data for a user of a web application. and I'm having trouble finding api usage examples that are not outdated. Your post here is the best and closest I have found so far, so thanks very much for that. 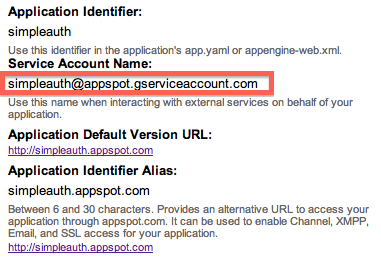 Now I understand that I will not be using AppIdentityService, since I want the spreadsheets to be owned and manipulated by the end-user's identity, not by the app's identity. I'm not yet sure what to use instead of AppIdentityService to accomplish this. If you happen to know and want to point me in the right direction, I'd be really appreciative :-) I not, then thanks for the great info you posted already. You will definitely want to check out "Authorization code flow" section on that wiki page, from the very first paragraph saying "Use the authorization code flow to allow the end-user to grant your application access to their protected data". I think it's pretty much what you're looking for. They also have some code examples there.